The only thing that we could be sure of with a run at Selsey is that it will be flat. We hope for dry but with global warming and a start point 20 metres from the shore line, well who knows? As it was a bit windy the preamble was short and without further ado we were off to find the trail. We circled the pond and 3 young boys asked what we were doing. When told we were on a 5 mile run they promptly joined in! Who says that today�s kids are lazy? We circled the pond and came back on ourselves to go past a parade of shops much to the amazement of the locals and down towards the fields at the edge of Selsey Town (Yes, it is a town) A crafty back check and we were led around the new building site where new houses especially commissioned by Lego are being put up. Old Faithful seemed to have an exact idea of where we were going, so he either spent his holiday years here or perhaps he was just lucky. A lucky hasher - perish the thought. We crossed the main road into Selsey, in fact the ONLY road into Selsey and onto the caravan site. We trotted through the site like happy grockles and then onto the school field which was nicely strewn with rubbish and cans. The Can Man did have a mighty haul. Off down a lane and some eager hashers were alleged to have over run a falsie but all was well and without any tears we headed for the high street. Although some were fooled the main pack crossed over and headed seaward. 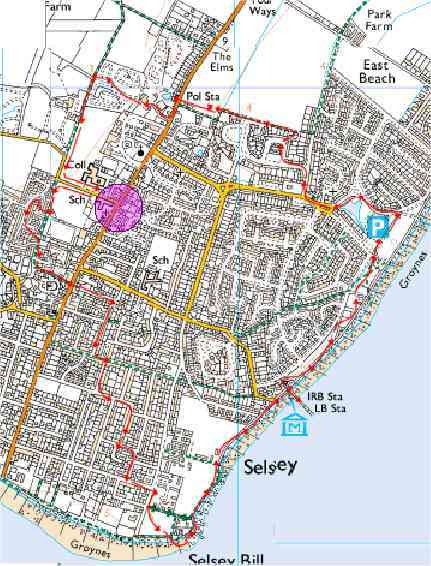 The trail wound us around the older houses in Selsey and on to the beach and a children�s play area. At this point our three young runners began to conduct an impromptu press conference with their friends telling them about the hash and the prizes to be won???? So finally what we had all been waiting for - a chance for a paddle at the seaside. The trail went along the shingle on the beach but nobody was brave enough to brave the waters of the English Channel. We came along the seafront to the lifeboat and the trail did in fact lead down the slipway but even hashers realised that the trail could not be that way - could it? One final housing estate and the scent of the chariots began to overpower the scent of the sea - ahh the smell of freshly treated sewage! With one final clever little check and ON IN was heard. The pack put on one last spurt (for the benefit of any onlookers) and then back home. As the hare was also the JM the chance of the hare getting the hashit was nil but in any case there was no real cause as it was an enjoyable trail. Deliberation and much thought came up with the idea of awarding the hashit to the three young musketeers who had joined us for the day, and so it was. Certificates were also handed out and they seemed please with their mornings work. Apres hash was at the Lifeboat Inn which was - next to the lifeboat. So back into the forest next time.